Everyday pleasures. My neon green transistor radio. The stack of ’45s I played on my turntable—the Temptations, the Jackson 5. Monday nights watching Laugh-In. Bazooka Bubble Gum. Astro Pops. Fizzies. It’s a 1960s childhood. I flattened my thick wavy hair with egg shampoo and wrapped it around my head every night in seventh grade, binding it to my scalp with bobby pins before bed. That was the style—straight, no bangs, and parted in the middle. These are some of the details of my days, delicious details that spell e-r-a. Your writing will be enhanced by adding some details of the era in your stories or even into a part of a story. What are some of the details of era that could help characterize the times you’re writing about? It’s easy to focus on the incidents, the big “what happened,” and leave out the details that define the times and make you more visible as a character in your own story. Pull back the camera lens when you’re writing to get the bigger picture, the wider focus, the broader scope. If you’re writing about your high school prom, for instance, what kind of car did you drive there? 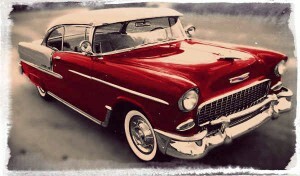 A shiny 1957 Chevy? An orange Ford Pinto? A blue Dodge Dart convertible? If you’re ice skating with friends in the skating rink on a Friday night, what song is playing? You don’t have to remember it to include it. Ask yourself what song might have been playing. Track the year it was and the songs that were popular in that time. Ask yourself questions when you review your story for era. How did you dress in those days? How did you wear your hair? What music was popular? What kind of car did you drive or did your parents drive? And think of the wider world, too. All of it sets the era and positions you in it. Baker creates story out of being born at home, never articulating it that way, but including some of the details of what was commonplace at the time—hospital births weren’t usual—and keeping it personal. By the political details, he sets the era, along with including the name of a popular song that was played in those days and on what kind of music player. Break it down into categories, and check for each when you’re done with your first draft. If you can add in a natural-sounding way, do it. It might be a few words; it could be a new paragraph. 1. Cultural — What were some popular styles of dress, kinds of music, types of cars? Is there anything to add about prevailing attitudes toward anything relevant to your story? 2. Prices/Everyday Items — What did things cost? Bazooka was a penny when I was a kid. Lunch at the school cafeteria cost 35 cents (that flashes through my mind every time I dig a dime and a quarter out of my coin purse). Pay phones cost a dime (and there were pay phones!). If calling home on a pay phone can figure into a story that takes place in my childhood, I’ll add it to show the existence of these things. 3. Historical/Political — Does your story take place during WW II, the Cold War, the Kennedy or Nixon era, the Vietnam War, the first years after 9/11? Was the Game Boy your favorite toy? Or was it a set of Clackers, or jacks? 4. Responses — How did you feel about the events or styles of the times? How did your family members react when you got that second piercing in your ear or came home wearing a mohawk or a mullet? What changes did they make in their lives or attitudes in response to a period? My dad, for example, wore scarves with a scarf ring around his neck in 1970, a huge switch from his conservative button-up shirts. —> Write about what you know from experience or from stories told within your family. You can always write more than you need in your first drafts and take some out in a revision. Ideas tend to generate ideas and you may get something really good by adding something you didn’t at first think was important. —> Do a little research. To fill in where you can use a memory jog or added details, search the Internet, talk to people who were there, keep a good historical reference book on your bookshelf. Here are two good reference books on 20th century America. This week, notice what’s in your life today that reflects the era you’re living in—the early 21st century. By doing this you’re practicing observation, you’re exercising awareness, an essential for writers. When you write or revise, interview yourself, using the category list to be sure you include the details of era, as naturally as you can.